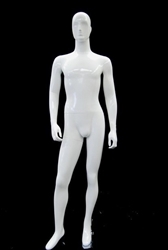 Our egghead male mannequin is in a straight on pose with Strait Legs. He is made of fiberglass with a glossy white finish. Base included with foot and calf supports.